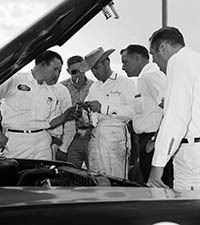 SEMA Hall of Fame - Henry "Smokey" Yunick, 2009, . There were really two Smokey Yunicks. The first was the stuff of legends. It wasn’t just bluster. 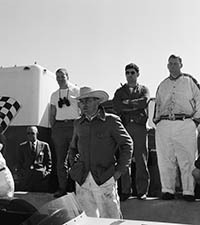 First in NASCAR, then at Indy, Yunick applied his prodigious mechanical talents to making fast cars and making cars go faster. The roster of men who drove for Yunick is a Who’s Who of racing champions, from Allison (Bobby) to Vukovich (Billy). 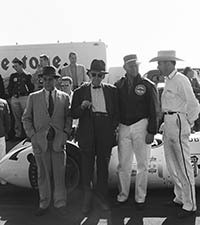 He won two NASCAR Grand National Championships as a car owner and mechanic, and he won at Indy in 1960 as the co-chief mechanic for Jim Rathmann’s Offenhauser-powered roadster. Yunick’s speed secrets could be so ground-breaking—or difficult to discern—that some hung another nickname on him: cheater. Yunick’s talents weren’t limited to the racetrack. 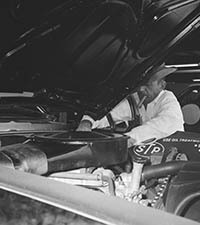 Pontiac, Chevrolet and Ford were among the auto makers that benefited from either his hands-on engineering or consulting work. 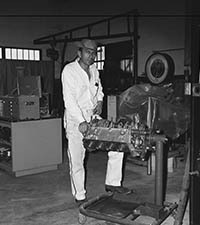 He is credited with developing, among other components, variable-ratio power steering, reverse-flow engine cooling and the extended-tip spark plug. Racer safety was a big concern of Yunick’s as well. 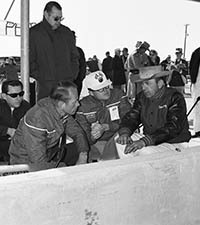 He stopped competing in NASCAR when the sanctioning body wouldn’t let him use a fuel bladder; and he designed a “safe wall” in the ’60s that would move on contact, absorbing some of a crash’s energy. The Yunick of legend could be blunt, even ornery. “Cantankerous, that’s a good word for it,” Trish Yunick said. But then there are the stories about the other Smokey, the one who would open his garage in the middle of the night to help a fellow racer, even if he was a competitor. Or who, in his later years, found time for a family that had learned to live without him for long stretches, especially from late April to early June.